John Linnell was one of the most important and characteristic painters of the English romantic period. He was born in London in 1792, the son of a carver. He received his formal instruction first from Benjamin West and then from John Varley. Linnell was admitted as a student to the school of the Royal Academy in 1815 and soon embarked on what would become a highly successful career, initially as a portrait painter. 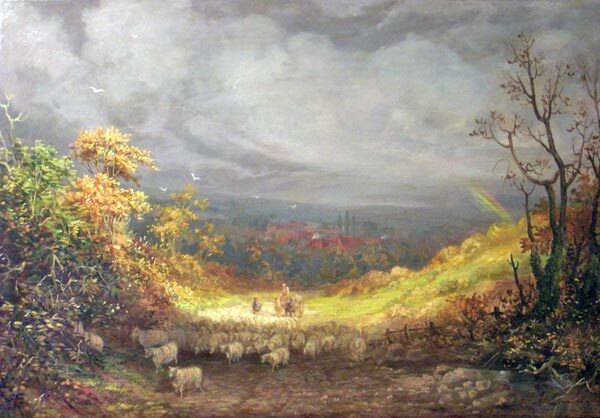 An engraver, a mezzotinter, a miniaturist, a watercolorist, and a painter of religious subjects, Linnell became best known for his depictions of the English countryside, often at sunrise or sunset and with dramatic lighting effects in the sky. A man of his time, Linnell numbered Irish genre painter William Mulready and watercolorist William Henry Hunt among his closest friends. He knew Percy Shelly and Shelly’s father-in-law William Godwin personally. His portraits include Thomas Malthus and Thomas Carlyle, and he was the father-in-law of Samuel Palmer. He was also one of the major artistic rivals of John Constable. Most important, however, was his friendship with, and patronage of, William Blake. Blake and Linnell form a fascinating study in contrasts. Blake was a late-bloomer who began actively working in the visual arts only in his late thirties and who achieved only scant financial success in his lifetime. Linnell was a prodigy, selling portraits at age ten. His work was in great demand, and he became sufficiently wealthy to purchase an estate in Surrey in 1850. Nevertheless, it was largely Linnell’s support of Blake that made the older artist’s later years comfortable and productive. Linnell died in Surrey in 1882, his style by then having fallen out of favor with English collectors and critics. Linnell’s work can be found in many major museums world-wide, including the Art Institute of Chicago, the National Gallery of Art (Washington, D.C.), the National Gallery (London), the National Portrait Galley (London), the Royal Collection, the National Gallery of Canada, the Philadelphia Museum, the Tate Gallery, the Metropolitan Museum of Art, the National Gallery of Victoria (Australia), and the Courtauld Institute. In 1982/83, a Centennial Exhibition of Linnell’s work was held at the Fitzwilliam Museum (Cambridge, England) and at the Yale Center for British Art.